President Donald Trump arrived Monday afternoon at the Finnish presidential palace in Helsinki for his summit with Russian President Vladimir Putin. US President Donald Trump and Russian President Vladimir Putin's one-on-one meeting — with interpreters — is running long. Reporters were ushered out of the room where the two men were meeting at 2:16 p.m. local time, presumably leaving Trump and Putin alone for their 90 minutes of scheduled solo time. As of this writing, the meeting is still ongoing. Trump and Putin's bilateral meeting at the G20 summit last year also ran long, with first lady Melania Trump reportedly poking her head in the meeting in an attempt to get Trump back on schedule. President Trump just spoke ahead of his meeting with Russia's Vladimir Putin. On the 2018 World Cup in Russia: "I would like to congratulate you on a really great World Cup." On what they'll talk about: "We have discussions on everything from trade to military to missiles, to nuclear, to China." On the US-Russia relationship: "I think we have great opportunities together as two countries that frankly, we have not been getting along very well for the last number of years. I've been here not too long, but it's getting close to two years, but I think we will end up having an extraordinary relationship." On nuclear weapons: "I really think the world wants to see us get along. We are the two great nuclear powers. We have 90% of the nuclear — and that's not a good thing, it's a bad thing." Trump did not say he would address Russia's meddling in the 2016 US election, which critics have called an act of war. Putin also offered remarks through a translator, but they were not immediately audible. He was greeted at the door to the palace by the Finish president, about 20 minutes after Putin arrived via the same entrance. The summit was already running about 45 minutes behind schedule on Monday after Putin arrived late at Helsinki's airport. Trump was held at his hotel while he waited for Putin, who is known for arriving late to important events, to touch down -- drawing comparisons to Trump's late arrivals at recent summits with US allies. CNN producer Sebastian Shukla counted 20 cars including an ambulance in Putin’s motorcade, and 29 in President Trump’s. Both men drove straight under a tarpaulin marquee and into a small courtyard inside the palace upon arriving. 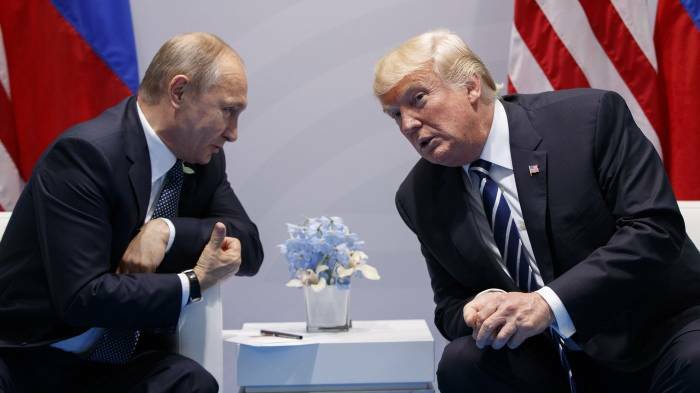 After months of exchanging long-distance compliments, Donald Trump and Vladimir Putin sit down on Monday for their first ever summit, a potential political minefield at home for the U.S. president but a geopolitical win for his Russian counterpart. Neither side expects major breakthroughs from the talks in the Finnish capital beyond warm words, an agreement to begin repairing battered U.S.-Russia relations, and maybe a deal to start talks on issues such as nuclear arms control and Syria. The two men, who have praised each other’s leadership qualities from afar, could also agree to start restocking their respective embassies and returning confiscated diplomatic property after a wave of expulsions and retaliatory action prompted by the poisoning of a former Russian spy in Britain. Russian Foreign Minister Sergei Lavrov told Russia’s RT TV station that he also had low expectations. He would regard the summit as a success if there was an agreement to merely reopen severed lines of communications across the board, he said. For Putin, the fact that the summit is even happening despite Russia’s semi-pariah status among some Americans and U.S. allies is a geopolitical win because, in Russian eyes, it shows that Washington recognizes Moscow as a great power whose interests must be taken into account. For Russia, it is also a powerful sign that Western efforts to isolate Moscow have failed. But for Trump, whose White House victory was actively supported by 12 Russian military intelligence agents, according to a recent U.S. indictment, and whose entourage is still being investigated for possible collusion with Moscow, the meeting is freighted with domestic political risk. “We can say confidently that Putin’s political risks are lower than those of President Trump,” said Andrey Kortunov, head of RIAC, a Moscow think-tank close to the Russian Foreign Ministry. A probe over allegations of Russian meddling in the 2016 U.S. presidential election has clouded Trump’s presidency. Trump has denied any collusion with the Russians by his campaign and Russia denies it meddled. The Helsinki summit is the capstone to a nearly week-long trip for Trump during which he has sown doubts about his commitment to the NATO military alliance, Washington’s so-called special relationship with Britain, and U.S. relations with the European Union that he called “a foe” in trade terms. Against that backdrop and swirling uncertainty about what Trump might do or say next, his summit with Putin, which will include a one-on-one session with the Russian leader with only interpreters present, has both U.S. allies and U.S. politicians worried lest he make hasty and sweeping concessions. Some politicians in the West believe the summit is happening at one of the most crucial junctures for the West since the 1991 fall of the Soviet Union. Certain NATO allies fear Putin might seek a grand deal that would undermine the U.S.-led transatlantic alliance. Trump has said that he will raise the alleged Russian election meddling with Putin but does not expect to get anywhere, has spoken vaguely about the possibility of halting NATO war games in the Baltic region, and has said repeatedly that it would be good if he could get along with Russia. On Friday, 12 Russians were indicted on charges of interfering in the U.S. 2016 election, a development that prompted some Democratic leaders to call on Trump to cancel the Putin meeting, a demand he quickly dismissed. On the summit’s eve, Senate Democratic leader Chuck Schumer, a political opponent of Trump, said he had told Secretary of State Mike Pompeo the Helsinki meeting was a mistake. “First, I don’t believe the meeting should take place but if it is going to happen, President Trump must press Putin hard on the issue of election interference. He can’t simply raise it, accept Putin’s denial and then let him off the hook,” Schumer said in a statement. Any Trump request for Russia to extradite hacking suspects is likely to fall on deaf ears, however, as the Kremlin, citing the Russian constitution, has a policy of not handing over suspects wanted by other countries. Many Western politicians remain angry over Russia’s annexation of Crimea, its backing of pro-Russian separatists in Ukraine, and its support for Syria’s Bashar al-Assad. Other accusations, denied by Moscow, include that it meddled in European politics, supplied the weapon that shot down a passenger plane in 2014 over Ukraine, and was behind the poisoning of the former Russian spy in Britain. Moscow would love to have U.S. sanctions - initially imposed over the Crimea annexation - eased and eventually lifted. But most in Russia do not expect the summit to produce such an outcome.